Initially designed and developed back in the 1830s, the electric vehicle has come a long way since then. Witnessing its prime during the early 1900s before seriously declining between the years 1940 and 1960, the electric car has now established itself as a possible future leader in car technology. The green energy aspect of electric cars could well cement their place in the future of vehicle development, as people are becoming more environmentally aware and wish to adopt greener lifestyles. Whilst the future of the electric car is yet to be determined, it is possible to see how far technology has advanced over the years. Here is how advanced battery technologies have contributed to the development of the electric car. The way electric cars work, is by using an on-board battery to store electrical energy which is then recharged when connected to an electrical supply. 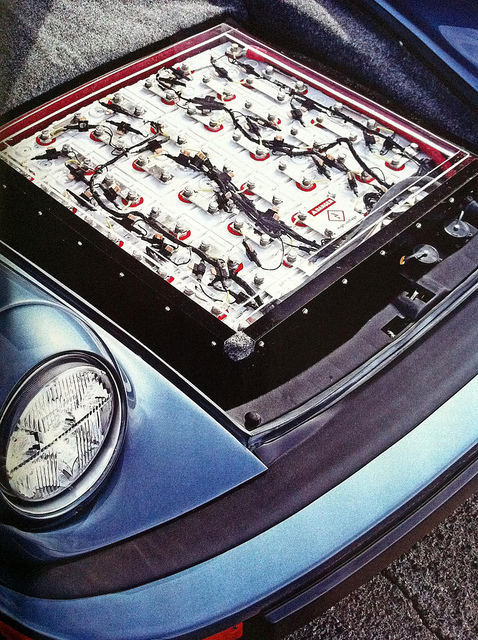 Until the late 1990s, the lead-acid battery was the most commonly used battery for electric vehicles. Since then however, the lithium-ion and lithium-polymer have been favoured as they are able to provide significantly improved performance and the longer vehicle range preferred by both manufacturers and drivers. The first electric car, invented by Thomas Davenport, was powered by a DC electric motor. However, a few years later in 1842, both Davenport and Scottish inventor Robert Davidson, decided that there was a need for the electric car to be more practical. That’s why they chose to incorporate the use of non-rechargeable electric batteries. This idea was topped in 1865 by Camille Faure who pronounced the need for better capacity storage batteries if the electric car was to be a practical vehicle. Gaston Planté was considered to be one of the great pioneer developers of batteries, due to his invention of the lead-acid battery in 1859. Later, Thomas Edison created the nickel-iron battery in 1901, causing much anticipation for the long-awaited new developments of the electric car. Before long however, the popularity of the electric car was replaced by gasoline-powered autos and the electric car suffered a decline. The invention of nickel-metal hydride (NiMH) batteries in 1989 seemed to turn things around for electric cars. It was this type of battery that was used to help save fuel during acceleration in Toyota’s hybrid-electric vehicle, the Prius. The only problem with a nickel-metal hydride battery is that it was unable to power the Prius over a long range, which meant that battery technologists had to come up with a better solution if people were to take electric cars seriously; hence the forthcoming of the rechargeable lithium battery in 1991. Whilst the early stages of this battery development led to it short circuiting, Sony created a battery that used a combination of graphite, allowing the lithium to be used without the risk of short circuiting. It worked by moving lithium ions between the two electrodes during charge and discharge, thus giving it the name “lithium-ion”. Bob Purcell has dedicated 20 years to the development of electric vehicles, and promises to not retire until he sees a high volume in them. Now chief executive of a technology start-up he founded called Protean Electric, Purcell and his team have developed a wheel hub motor that could finally mean that the electric car is practical for drivers everywhere. Basing his research on the fact that fossil fuels are in short supply nowadays and the use of all of which will seriously impact the environment, he predicts that the electric car will soon become the viable option for car purchasers around the globe. Thanks to Purcell’s team, getting your hands on subprime car finance will not mean a large cost for the consumer. The production of the new electric car is due to start in 2014, so consumers will not have to wait long to see the effects.